The Perfect Gentlemen provide the perfect blend of harmony and humor harkening back to the days of Vaudeville. 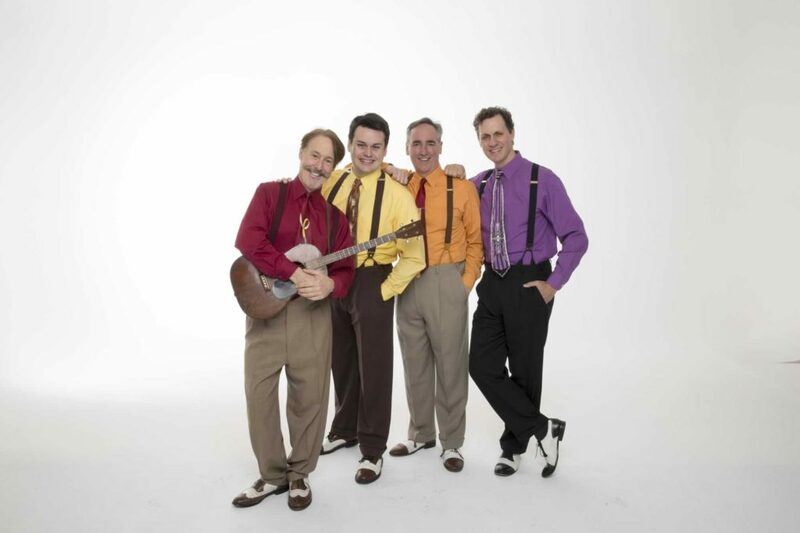 Preserving America’s great vocal sounds from a time when music was music, The Perfect Gentlemen recreate the close harmonies of such legendary groups as The Ink Spots and the Pied Pipers, while including the era’s great comic songs made famous by the likes of Louis Jordan and The Hoosier Hotshots. A typical performance by The Perfect Gentlemen includes marvelous melodious music mingled with masterful mirth, mischief, and merry-making. The group’s versatility allows for effortless shifts between vocal styles with an air of ease, whether singing a cappella or accompanied by guitar or ukulele. Their signature piece, Salute to the 20th Century, is a humorous take on the de-evolution of music over the last century, illustrated by singing the same song in the style of Barbershop, Dixieland, Blues, Big Band, Doo-Wop, Bluegrass, Disco, Techno Punk, and Rap, complete with visuals that delights audiences of all ages time and time again. The Perfect Gentlemen is made up of four performers of unparalleled talent. Jim Campbell (Bass) anchors the group with low notes he expertly crafted as the long-time bass singer of the famous Dapper Dans of Disneyland. Tim Reeder (Baritone/Ukulele/Tenor Guitar) brings to the mix a knack for uncovering hilarious musical gems, amazing period vocals, expert instrumental accompaniment, and his own composing talents, from his years with the 1930’s-era vocal jazz group Vocalworks. Phil Gold (First Tenor) rounds out the group with high notes honed with quartets in the touring stage musicals City of Angels and Forever Plaid. Together as The Perfect Gentlemen, these four entertainers complement each other in a way that is nothing short of perfect. Formed in 1998, The Perfect Gentlemen has performed shows all across the U.S., made several concert tours of the United Kingdom, played numerous cities across Brazil with Jazz Festival 2006, and headlined aboard cruise ships on the Holland America Line. 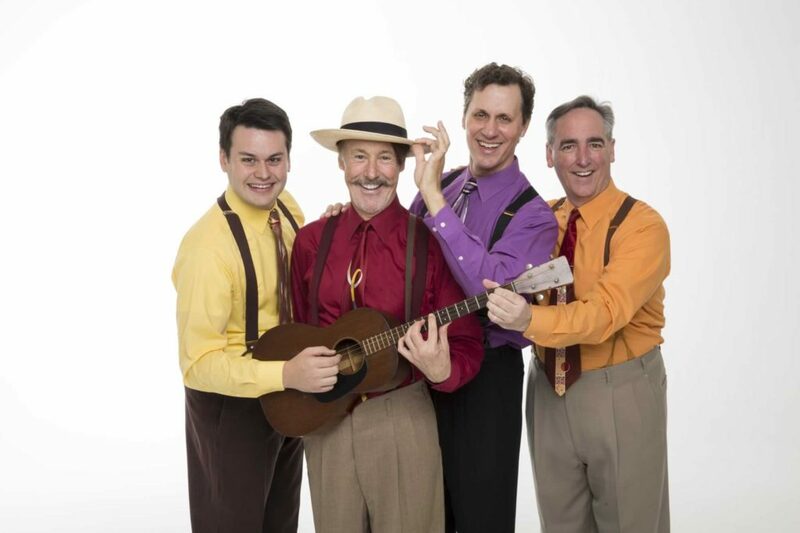 Additionally, the group has sung with the Pacific Symphony and the South Coast Symphony, appearing as the barbershop quartet in a staged concert version of The Music Man for the latter. Major corporate clients have included Disney Entertainment Productions, San Manuel Indian Bingo & Casino, the L.A. Economic Development Corporation, the Rose Bowl Foundation, and the Make-A-Wish Foundation, among others. Educational as well as entertaining, the group performs their show 100 Years of Harmony as part of the arts education rosters for the Los Angeles Music Center, Orange County Performing Artscenter’s Arts Teach, Performances To Grow On, and Young Audiences of Kern County. The Perfect Gentlemen have released three recordings: Beside Ourselves (1999), Style! (2000), and 4 Beers & 10 Tags (2003), along with a concert DVD: “Live!” in Paradise (2006). Their singing voices can also be heard as belonging to ghostly miners on Mystery Mine, the new thrill ride at the Dollywood theme park, and to four animated bioluminescent fish in the films Deepo’s Undersea 3-D Wonder Show at the Georgia Aquarium in downtown Atlanta and A Fish Story at the Aquarium of the Pacific in Long Beach, California. Once you’ve heard The Perfect Gentlemen, you won’t settle for anything less!